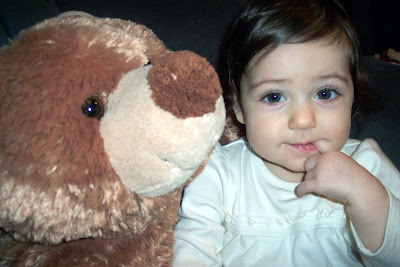 I know I have at least mentioned the monthly bear pictures so I can show Cate's growth throughout her first year. But to elaborate, I'm taking pictures each month with the same stuffed animal, and then at the end of her first year I can make a scrapbook page with the 12 pictures. Well, our monthly photo shoots with the bear always have plenty of out-takes. The ones of her doing other things -- grabbing the bear, chewing on the bear, falling over -- really show what she can do and how she is, so I'm liking those as much or more than the posed ones. She looks pensive. Like she's plotting her next move. she's so cute i want to squueze her! i can't wait til christmas eve! I love this idea. I can't wait to see the layout.